Sometimes I see a project or recipe online and bookmark it, hoping to come back and try it later (recently I started adding those cool things to a Tumblr page, linked at the top of my blog). Other times the project or recipe looks so amazing, so compelling, that I’m convinced my life will be incomplete until that particular thing is made or attempted. That’s how I felt about this magnetic chalkboard. If you want to try this, please read Julie’s post (above link) first. It’s all about the dos and don’ts of the project and has invaluable tips, like purchasing sheet metal instead of magnetic paint since apparently chalkboard paint strips magnetic paint of its superpower. Things like that are pretty crucial. My quest began at Hobby Lobby in search of chalkboard markers, which I’d read about from Nester. The $10 I paid for 4 markers seemed pretty steep until I saw that Nester’s pack of 4 was around $20 at Michael’s. These are an investment and not something you want to leave lying around for the kids to play with (although those little heart embellishments on our chalkboard weren’t added by me, so maybe I’m not doing such a great job of this myself). I noticed that backless picture frames were 50% off, so I made that unplanned purchase (which may or may not have been the best plan: just keep reading). Up until that point I wasn’t completely sure where I would put the magnetic chalkboard, just that I wanted to make one. Our house is full of simple black frames, but I went with an off-white, distressed one and decided to hang it in a nook in the kitchen. Since the entire center would be chalkboard black, I thought a black frame would be overkill. 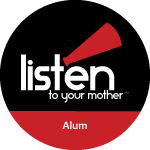 In Julie’s post, she tells about shopping at Home Depot and discovering that sheet metal is cheaper in the plumbing department than in the regular sheet metal section. I had the same experience at Lowe’s. Our frame is 24″ x 30″. My husband is a sweetheart and trimmed and sanded the sheet metal for me. We have an unfinished basement, so I opened the doors and applied the chalkboard spray paint down there. The fumes were bad and you need multiple coats, so I recommend taking it outdoors. You’ll need to block off some time for the painting, too. 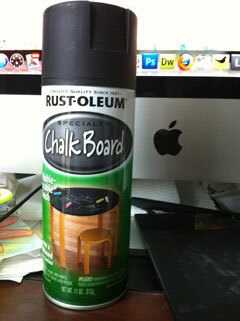 The original tutorial recommended Krylon chalkboard spray paint, but I couldn’t find any so I bought Rust-oleum. The can says, “Apply a second coat within an hour or after 24 hours.” I applied 3 coats, each 20 minutes apart. Because I bought that backless frame, my husband had to build a back out of plywood. Unfortunately, the chalkboard area had too much “give” to write on easily and he had to put a second piece of plywood behind it. We also had to buy heavy duty saw tooth picture hangers for the back of the frame and wall anchors instead of just nails to hang it. 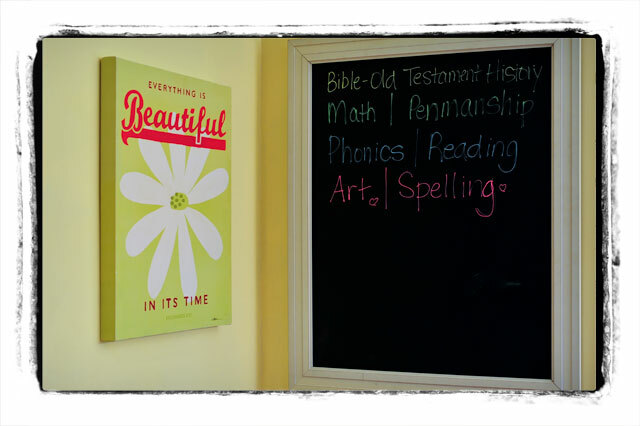 Two sheets of plywood, a wooden frame, and a piece of sheet metal make this chalkboard heavy! The nook where it’s hanging is between our kitchen and eat-in kitchen area. There are too many of us to eat together at this table—we use the formal dining room—so it’s become a school area, complete with bookcase and dry erase board on the wall. I wanted a smaller surface for notes and non-homeschooling related stuff. After admiring it blank for a couple of days, I did jot down some school ideas and subjects in an attempt to nudge us out of March burnout. Have you tried any DIY projects lately? Where did you purchase the chalkboard?? I love it! !